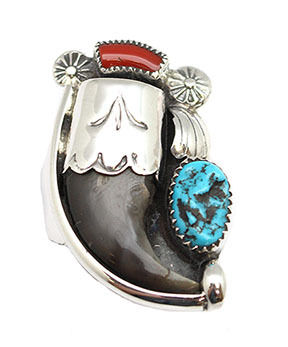 This mens ring has one natural bear claw and one each of natural free form turquoise and coral stones. Bear claw cap is stamped and has stamped drops and a fan around it on a hand made plate and wire shank. Top measures approximately 1 1/2" long by 1" wide. Claw size and stone sizes will vary. It is Navajo hand made by Ernest Hawthorne. Currently available in sizes 11 thru 13. Choose size when ordering.